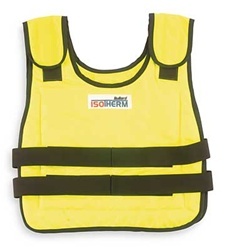 Vest, Cooling, Size Medium/Large, Length 16 In., Hi Viz Yellow Color, Proban Treated Cotton, Hook and Loop Closure, Chest Size 36-44 In., Temp. Rating 55 F, EN531, EN470-1 Standards, Weight 6.5 Lbs., Includes 2 Cool Pack Pairs. Engineered Isotherm(R) maintains constant temperature of 55 Degree. Interchangeable front/back cool pack system provides continuous cooling up to 2 1/2 hours. Cool packs can be recharged in cold water in 20 minutes.